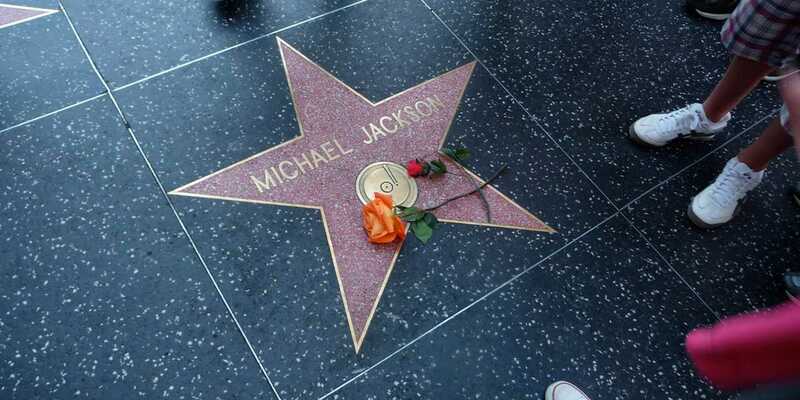 It comprises more than 2,500 five-pointed terrazzo and brass stars embedded in the sidewalks along 15 blocks of Hollywood Boulevard and three blocks of Vine Street. Each of the handsome terrazzo-and-brass stars costs about $30,000 to install and maintain. The most interesting part and notable names are located between the 6800 and 6900 block in front of the Grauman's Chinese Theatre. Even the most jaded visitor may thrill here, where generations of screen legends have left their imprints in cement. You will find handprints of Michael Jackson, Marilyn Monroe, John Wayne, Elizabeth Taylor, Sophia Loren, Clint Eastwood just to name a few. Right below the name of each celebrity on the five-pointed stars is a small, round emblem which illustrates the celebrity's category, with one of five symbols: a motion picture camera, a television set, a phonograph record, a radio microphone and the twin theatrical masks of comedy & tragedy. The Hollywood/Highland station on the red line drops you off in the heart of Tinseltown, where the Walk of Fame and many more attractions (the Hollywood Bowl, TCL Chinese Theatre, Madame Tussauds Hollywood) are all within walking distance.